On Tuesday evening The Dulcinea and I met up with aspiring brewpub owner Joe Walts. His full-time job is concocting plans for a new brewpub – The Republic - here in Madison and he keeps the world abreast of his adventures at his blog. Joe was an incredibly affable fellow who related to us his humble origins in suburban Detroit and how he fell in love with Madison. If his amicability wasn't enough, he revealed that he is a fan of LOST which endeared me to the man even more than I am instantly endeared to people who brew. I asked Joe about his business plans and he slowly laid forth his vision of a neighborhood tavern. It would be a place where folks can walk in to enjoy a good brew and good company. Although no large menu is in the works, Joe still wants a modicum of food available for hungry patrons. We talked about The Malt House and its lack of televisions which prompted him to say that he'd have a TV but would probably have it on only for sporting events. House Ale - the signature session beer of RePublic! Pale Ale - we'll name it Heartattack and Bine if Tom Waits doesn't sue us. Scottish Heavy - the name is misleading; it's a session beer. Belgian Pumpkin - a Squashed Stereotype, if you will. Grapefruit Lager - a light lager spiced with grapefruit zest. Wildflower Belgian Pale - a restrained Belgian ale brewed with wildflower honey. 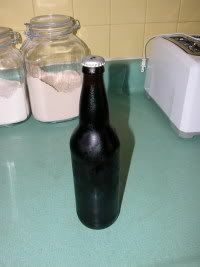 Cardamom Coffee Stout - thanks, Kevin, for the Arabic coffee idea. Maple Biere de Garde - a farmhouse ale with unrefined Maple syrup. Old Ale - a blend of fresh beer and stock ale that's been inoculated with Brettanomyces and aged in wine barrels. Grand Cru, aka the Raspberry Belgianwine. Imperial Black Lager - aged for a year before serving. Joe emphasized the fact that he wasn't out to join the big beer race. They would be available, but he was keen on providing session beers and, more generally, just offering an interesting variety of brews. Because I like to help out my local zymurgists, I offered to slap some paint on the walls of his new place or any other grunt work he may need done such as checking on the tap lines by pouring myself a few pints. So stayed tuned as I intend to be the second blog in town to announce the brewpub's color scheme. 20+ ounces of Joe's second batch of mint porter. Soon I hope to open it and enjoy some in a glass and the rest on top of some ice cream or custard, as per the brewer's strict instructions.